Looks like there might be room at Google for the nearly 150 Yahoo employees who are about to get pink slips. As online power transitions, Google says it's beefing up it's payroll by at least 6,200 jobs, which will increase its workforce by about 25 percent. It's the biggest expansion yet of the Internet's most profitable company, which grew by 23 percent last year and hired nearly 4,600 people. Although Google execs have not yet elaborated on what those jobs will look like, analysts suggest they will be mostly in sales to stay on top of advertising, and computer engineers to maintain the company's lead in online search. It's also suspected that Google will diversify into other computing services, content production, telecommunication, and media -- especially video. But all the new Google jobs will not necessarily be in the US. The company says that more than 1,000 new jobs with the company will be in Europe in 2011. Google is a growing international company, with more than 60 offices in 30 countries. It is the most visited website in the US, and gunning for the same status worldwide. 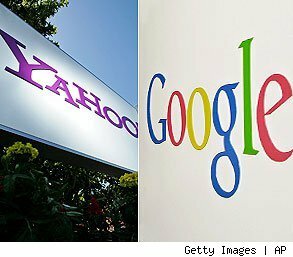 The day after Google made their announcement regarding the 6,200 new openings with the company, Yahoo made public its plans to layoff from 100-150 workers. That totals about one-percent of the company's estimated 13,500 employees. This is the second patch of pink slipping in two months, as Yahoo released 600 workers just before Christmas. Not much is known about which departments will be cutting back, but it was mentioned that these cuts will affect offices worldwide. It won't necessarily be easy for the jettisoned Yahoo workers to secure new Google gigs. It's reported that the company receives over one million applications per year, partially because they have a reputation of taking care of their own. Meals, snacks, and drinks are free at most Google facilities, and many employees can commute to work on free shuttles equipped with Internet access. Google also gave their employees a ten percent raise across the board last year, and all employees receive stock options. But to get hired and enjoy those perks, job candidates have to go through an excruciating screening process that analyzes SAT scores, grade-point averages and their performance on demanding and uber-complicated tests that only the most cutting edge at the very top of their game can pass. Once on board, pressure and performance expectations are intense. Still, the coveted Google gig continues to be nice work if you can get it. Yahoo employees feeling the pinch should waste no time in applying.